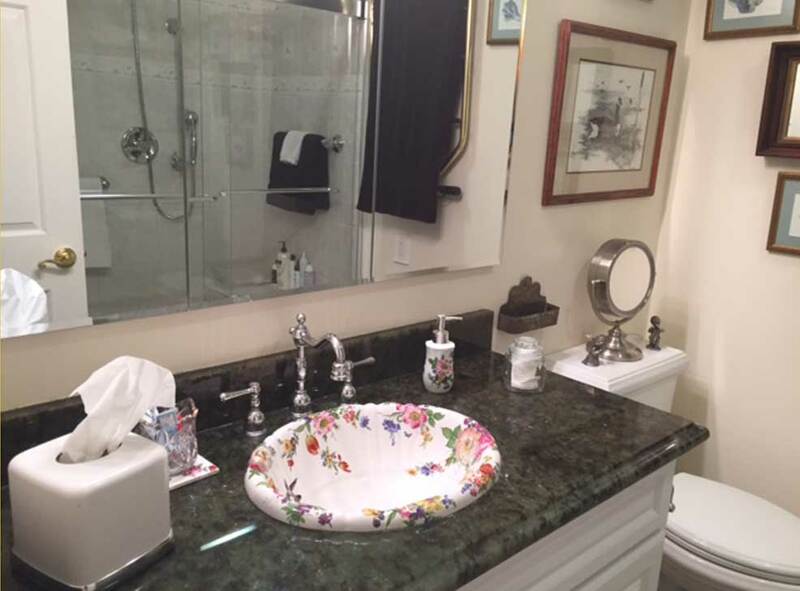 This post features the Scented Garden & Gray Hummingbird painted sink in a traditional guest bathroom. Sorry the photos are a bit blurry, they are customer supplied. The Scented Garden design is one of our most popular, and can be applied to any type of sink, drop-in, vessel or pedestal, toilets and of course accessories. It’s available for sale on our website, decoratedbathroom.com and this particular version is also for sale on the Houzz marketplace, Scented Garden & Hummingbird Painted Sink. The dark gray granite counter and otherwise neutral color scheme really allow the colors in the design to shine. The selection of paintings and wall decorations give the bathroom the final touches and make it look finished. I love that touch, gives you something to look at white you are seated. Here is another view where you can (kind of) see the gray hummingbird painted on the sink. You can just see at the front right of the photo the matching scroll-edge soap dispenser, also with the Scented Garden design on it. 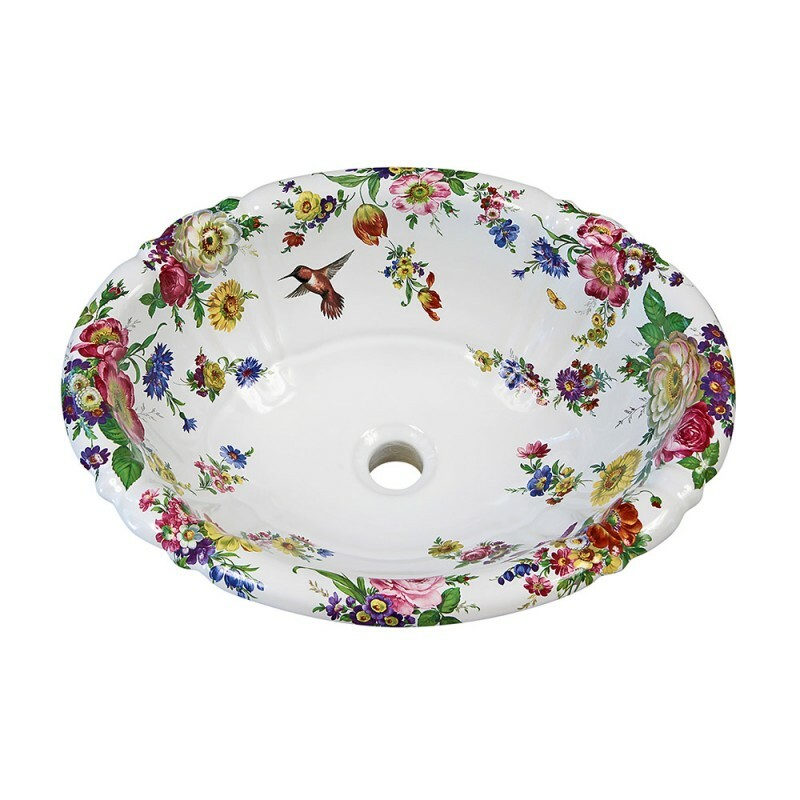 Check out the Accessories page on the website where you can see all the accessories we have available for decoration, as well as the Accessories Gallery page, with a bunch of examples of decorated porcelain and ceramic bathroom accessories. One other thing I would like to point out is the switch plates or wall plates, they are nice, too bad one is crooked. Those darned electricians!!! 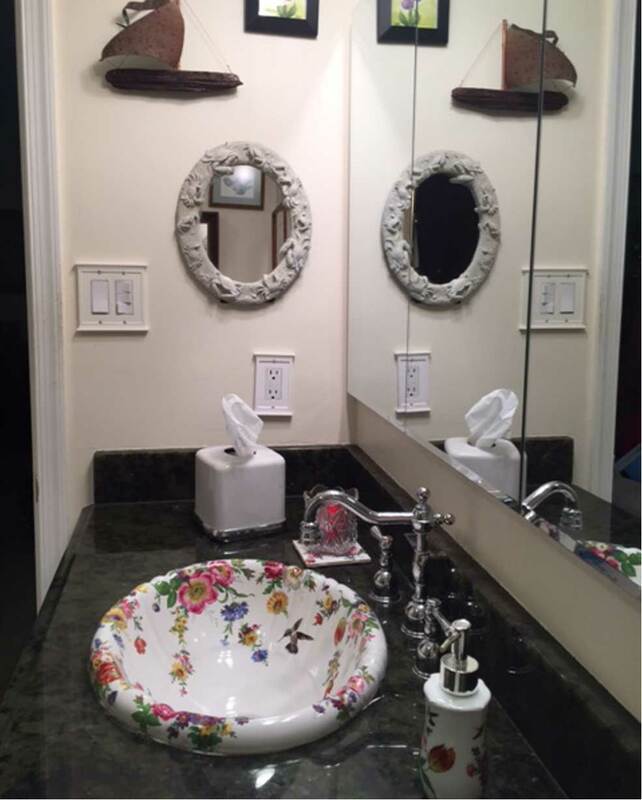 The design on the sink features brown hummingbird and is painted with flowers ranging from tulips, poppies, roses, daisies, violets, iris, morning glory, cornflowers, chrysanthemums and more, with a ladybug and butterfly too. All the different colors in the flowers are easily coordinated with any bathroom decor. It’s one of our most popular designs and always in style. This is a slightly different version of hummingbird on this design than is shown in the photos above. The customer wanted a gray one to match her counter and I was only too happy to accommodate.